Red Truck Painting provides residential and commercial painting for Rochester, NY and surrounding areas. We have painted many older homes in Rochester, including historic properties in the Corn Hill area. Atkison St has several beautiful homes that we have worked on both inside and outside. In 2012 we painted for the Daughter's of the American Revolution. This is a very old building, which was fun to work on. 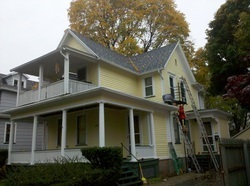 One of our locations is in Rochester on Pearl St. Look for the bright yellow house!